ADS is an experienced solutions provider of records management services to Florida Government offices. Advanced Data Solutions specializes in wide format scanning services to engineering firms, construction companies, and municipal growth management, planning and building departments throughout Florida. 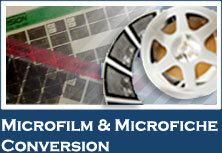 We provide conversion in Black & White bitonal, color and grayscale formats. 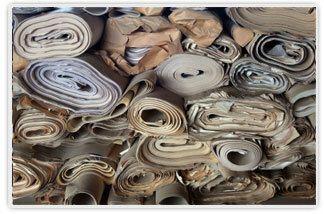 Our service bureau converts approximately 100 tons of paper annually operating three shifts of production daily. Our throughput approximates 700 record boxes or 1,500,000 images monthly, a substantial amount of which consists of large format blueprints and drawings. We manage both small and large client projects maintaining a focus on quality, timeliness and cost effectiveness. Conversion pricing is based on a per image basis. Image count estimates can be provided by simply reviewing a sample box of records. Although counts may vary, general estimations of a standard 10” x 15” record file box are as follows. Standard File Boxes with All Size Documents Including Wide Format – typically contains 1,500 documents and 100 – 150 large format documents. Rolled prints will vary in count based on the size and volume of each project. 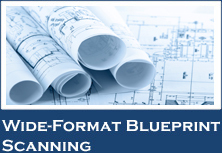 Large Format (Blueprints) pricing averages between $.50- $1.00 per page. Discounts for large volume are available. Our pricing is simple and typically includes the following line items. 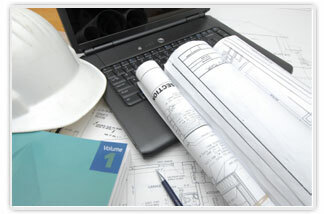 Wide format Drawings and Blueprints are typically scanned at resolutions at or above 300 dpi. Florida municipalities are governed by rules established by the Florida Department of State which recognizes both the tiff and pdf file as the standard for Electronic Record Keeping Requirements. A direct link to these standards is on this page. Quality Assurance is the driving force behind our success and industry experience within the conversion specialty of Large Format records. Client records are reviewed up to 10 times prior to data submission and archival. Certain quality control procedures are outlined below. Image & Index Quality Review for each individual Large Format Drawing from an independent and experienced review technician. Conversion projects are scheduled to achieve the fastest data conversion possible. We schedule pick-ups and re-deliveries based on client needs and internal production schedules. Timetables are established with client personnel to ensure data is converted and transmitted within a few business days. ADS has multiple cargo vans which travel local and statewide routes on a daily basis. Schedules are coordinated weeks in advance to accommodate client needs. We handle small and large pick-ups and charges for such services are minimized based on scheduling efficiencies. Record requests are handed routinely and expeditiously. Our request email address gets routed to a minimum of six people within our organization so that client requests are satisfied within minutes.